Setting New Year’s Resolutions is the easy part. Now it’s time to stick with them and reap those healthy rewards! 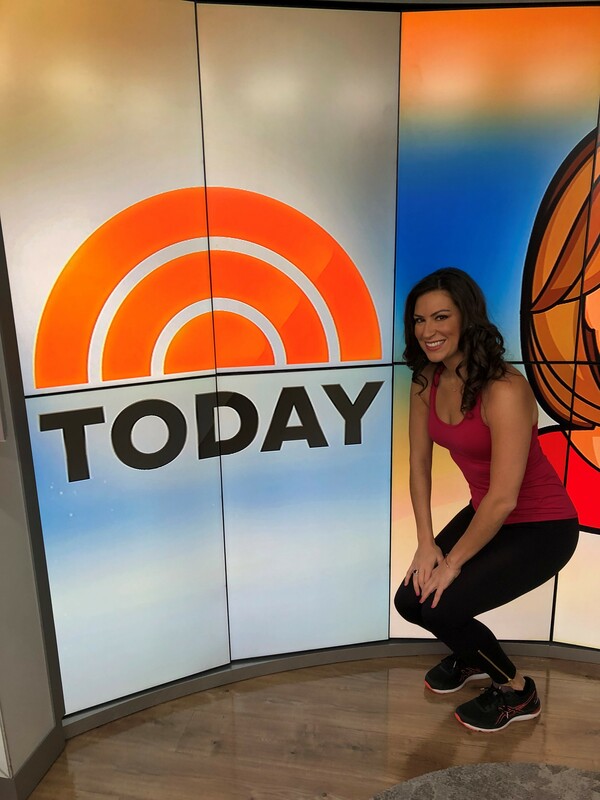 Health and Fitness Expert and Women’s Weight Loss Coach Stephanie Mansour appeared on the Today Show to share five simple ways you can help yourself succeed in your healthy resolution goals. I’m all about keeping fitness fun and sustainable, so here are five fresh tips to help you stay consistent on your path to weight loss! If doing a full meal prep on Sunday is too much, start by committing to prepping just one thing on the weekend. I recommend boiling some eggs. Throw a dozen eggs in a large pot of boiling water on the stove, and voila! Quick, protein-rich snacks that are ready to grab and go all week long. For more help with meal planning or nutrition advice check out my Recipe Book! One of my own private weight loss clients actually schedules walking meetings with her colleagues—so great! If you have a coworker you’re close with or someone you know has similar fitness goals, why not ask them to walk around the building with you on lunch breaks? If it’s a nice day you can walk outside and get fresh air or depending on where you work you can walk up and down your office stairs to really get that heart rate up. That bit of movement might even motivate you to hit up the gym after work! It’s not the end of the world to feel a little hungry, often when we feel those hunger pangs first hit we are tempted to act on them immediately. Take some time out and drink a full glass of water. This will make you slow down while also filling you up, and hydration really is so important! I’m not saying don’t feed yourself when it’s appropriate to, but if you are on a weight loss journey and in a caloric deficit the truth is sometimes you will feel hungry. Mmm, right? Not so fast! This is one of my hacks to help you stay strong when those late night cravings for all the sweets hit you! Keep a bottle of lotion in your snack cupboard and before you reach for the junk food make sure you put that lotion on your hands first. Who wants to eat snacks that smell and taste like lotion, right? Not me, no thanks! Last, but not least, here’s a way to improve upon your life-giving morning cup of coffee. This is especially helpful if you’re not a breakfast person or don’t like to eat right away in the mornings. Try adding a scoop of chocolate protein to your first cup. It’s super delicious and will provide you with energy to get through your entire day! Most of us enjoy scrolling through Instagram in our spare time, and you can find a lot of high quality fitness inspiration if you are following the right accounts. 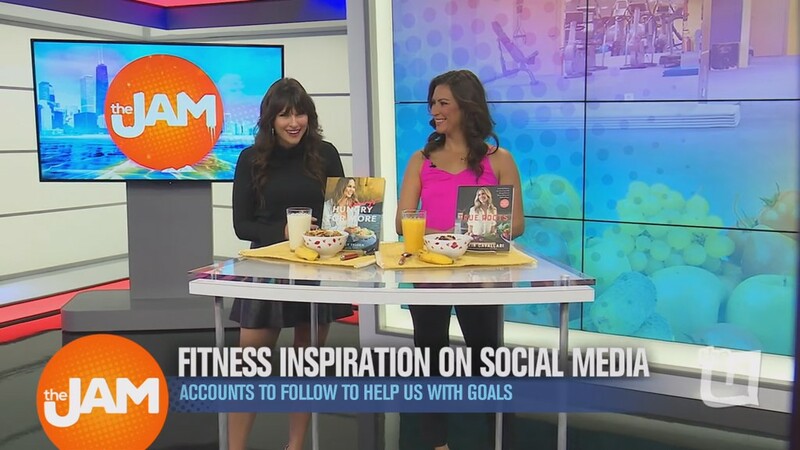 Health and Fitness Expert and Women’s Weight Loss Coach Stephanie Mansour appeared on the Jam to discuss how best to use social media for inspiration and a few celebrities she recommends you give a follow! Instagram can be a great place to learn new recipes. I’m sure you’ve seen your share of incredible looking meals while scrolling through! Two of my favorites to follow for foodie inspiration: @chrissyteigen and @kristincavallari. Chrissy Teigen is on her 2nd cookbook, Cravings: Hungry for More , and what I like about this book is it’s healthy, but not super healthy. It really is about making and enjoying the foods that you crave, lightened up a little, but still with all the delicious! I am always reminding my private weight loss clients that a key to success is: don’t deprive yourself. If you crave something figure out a way to eat it while still moving towards your fitness goals. Kristin’s cookbook is called, True Roots: A Mindful Kitchen with More Than 100 Recipes Free of Gluten, Dairy, and Refined Sugar and it is, as the title suggests, pretty dang healthy! If your New Year’s Resolutions include ditching sugar or going gluten or dairy free this could be a really wise investment for you! If you’re looking for healthy recipes to try this year and would appreciate some of the guesswork taken out, check out my 7-Day Easy Meal Plan + Recipe Book. It features anti-inflammatory recipes and even has a shopping list for your convenience. Octavia Spencer– she posts a lot of videos of the exercise circuits she completes with her personal trainer, and even works out while on set! Talk about inspiring, right? If she can do it, you can do it! You can follow her @octaviaspencer. Jessica Biel– What I love about the videos Jessica posts is that she tries really challenging stuff and celebrates after she nails an exercise she’s been building up to. It’s so important to both challenge yourself while celebrating your achievements and strength gains along the way! Follow her for more @jessicabiel. The Rock– He is a powerhouse, am I right?? What’s really inspiring about watching his workout videos is he’s very into high intensity interval training which is one of the most popular fitness trends of 2019 and has been for several years past! With HIIT you really are pushing yourself to your limits, going for that last rep, or your last breath, super challenging stuff! His epic IG is @TheRock. Hugh Jackman– Most celebs have personal trainers, and what I like about Hugh’s Instagram is he actually shows himself working out with his trainer! If you’re ready to take your fitness to the next level this year, consider hiring a personal trainer to help you succeed. I love being a private weight loss coach and working with women to achieve their health goals. Follow @TheHughJackman to see more of his impressive workout sessions. where I share motivational quotes, occasional recipes, and even host giveaways! Ready for a New Year of goal smashing? Health and Fitness Expert and Women’s Weight Loss Coach Stephanie Mansour has compiled all the info you need to succeed. Make 2019 your fittest year yet! Have you set any New Year’s resolutions yet? If you’re feeling overwhelmed and not sure where to start, I have some resolution suggestions you can choose from. Often we set really big, lofty goals and struggle to stick with them for the whole year. By breaking these goals down into smaller, more manageable steps you’re more likely to stay consistent and see results! Click here for 3 Low-Key Fitness Resolutions. Are you wanting to start at a gym to achieve your New Year’s goals, but worry about how to fit the expense into your budget? A gym membership is a great investment towards your help, so I’ve put together some hacks that will help you save the most money possible. How To Save On a Gym Membership —> here. Now that you’ve got a brand new gym membership, you may feel too intimidated to actually go work out there. 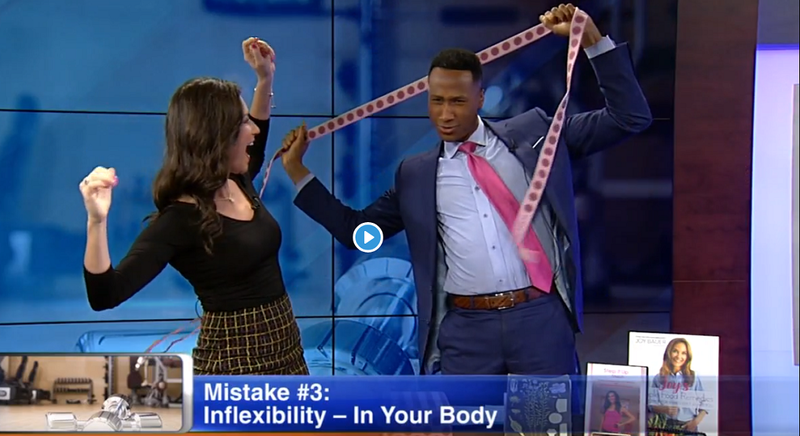 If you’re new to the gym and feeling nervous—I’ve got your back! Remember that everyone is at the gym for more or less the same reason, so try to relax and enjoy moving your body! Short on time? Maximize your fitness with these five one-minute tips! Work your abs before you even get out of bed in the morning, change up your reps during strength training, and foam roll at the end of every workout are just a few of my quick tips to transform your fitness routine. Read all 5 of my 1-minute fit tips: here! Speaking of transforming your fitness routine, need a fresh cardio workout for the New Year? Walking is always a great start to exercise, and here is how to Step It Up with interval training! I wrote this article for NBC News Better, outlining how to do three different types of treadmill workouts. There’s even a downloadable calendar included that you can print out for your fridge or planner! Get the free 31 Day Treadmill Plan here. If you’re more of a work-out-from-home type, maybe treat yourself to a new workout DVD and commit to doing it a few times per week? Make sure you schedule your workouts on your calendar in advance that way you won’t be tempted to skip it! Follow this link to purchase my Step It Up with Steph Signature SlimDown Workout DVD. Ready for a hot new workout move?? It’s a strength builder, but it’s also a balance challenger, oh and also it’s cardio! This move will hit every single major muscle in your legs, while activating your core and making you sweat! Grab a moderate weight to hold to complete this single-leg deadlift into a forward lunge. Watch the move and read the breakdown here. Are you in for another amazing year of prioritizing health and happiness? If you haven’t already, now is also the perfect time to look at my 30 Days To Love Your Body & Your Life Workbook which one of my private weight loss clients used to lose 83 lbs in only 12 weeks! The list of the top fitness trends for 2019 has dropped! Read the article below to hear my thoughts on which ones to incorporate into your existing workout routines, and which ones to be cautious of. 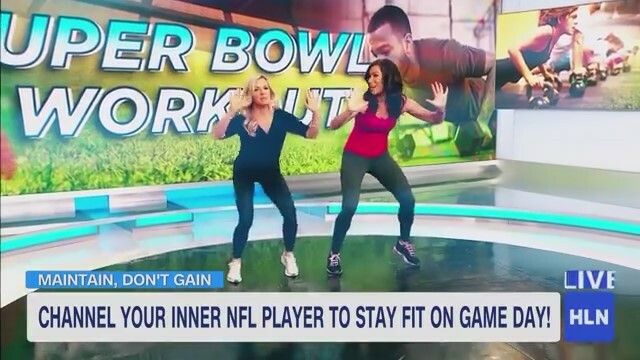 Check out the top 2019 Fitness Trends here. Worried about sticking to your new resolutions? I’ve got something for that too! I recently contributed to this very helpful article about exercising your mental strength to keep those physical gains coming. Learn all 13 of those Mental Strategies by clicking here.